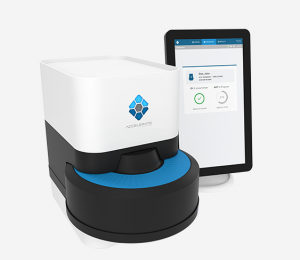 Accelerate Diagnostics (AXDX) is a good example of a new technology that had a market valuation that was too high given their current stage of development. They target a large potential market. Infections are a huge problem in healthcare but figuring out what the infection is and how to treat it takes far too long; on the order of days. Before going on we should warn investors that we’d consider AXDX a “cloak and dagger stock” based on the amount of controversy and short-sellers actively involved with the stock. Analyst coverage is limited, despite the substantial market value. Extra volatility is to be expected. We actually discovered AXDX as a short based on our initial research. After taking a position we did further work and attended a live conference presentation and Q&A with the management team. Most of what we learned (see below) bolstered our short thesis. However during this time the stock price declined from $30 to $18 and a few positive things happened (again see below.) As a result the risk/reward is more balanced, at least for now. During our research activities we also came to know more about some other players in the space like GenMark Diagnostics (GNMK) and T2 Biosystems (TTOO) which sit in a crowded but very active diagnostics industry. In the past any small company that has been able to generate commercial success has been acquired by one of the larger players like an Abbott Labs (ABT), Becton, Dickinson (BDX) or Roche. We’ll be looking for more opportunities in this segment. Testing for infections in microbiology labs has remained a manual and time-consuming process. At 14 million tests/year at $200/test the annual market is over $2B. More broadly defined estimates on the annual cost of these infectious diseases in hospitals is in the $10B range according to the Infectious Diseases Society of America. The winners in this market will get revenue from new instrument placements (~20,000 WW) and then from consumables as tests are performed. Although there are lots of competitors in this space it’s more complicated than it at first appears because there are different paths to the goal. Those that use fundamentally different testing methods or yield results in a different format than the market is used to will find adoption more difficult, especially in the very traditional and process oriented world of clinical medicine. So far the AXDX approach and focus on susceptibility testing results looks like a differentiator. Intellectual property (IP) protection is in place. A small company like AXDX is unlikely to be able to use their patents offensively but they offer some protection and enhance the value of the company to potential acquirers, especially if AXDX gets FDA approval. There’s a pipeline of products in place which can expand the TAM and support longer term growth. After blood the obvious suspects are all in development – respiratory, skin and urine. We’re listing management as a positive here although not everyone will agree with that. These guys are ex-Ventana Medical Systems which was very successful taking an approach to this problem and was acquired by Roche for $3.4B in February 2008. No commercial product yet. Lots of sizzle but no steak so far. Even with the recent decline the company still has a market capitalization of $800M and an TEV of $750M. The process of going from pre-clinical through clinical trials to FDA approval is fraught with complexity and delays that could result in no FDA approval in 2016. The approval hurdle is high because the results must hit the success threshold for all 70 assays. What that means is that although the devices has been tested and has meet the success threshold in aggregate, that’s not enough. If they get 69 right and one wrong it means no approval. Even if things go to plan the company is years away from generating any operating profit. In fact they will be investing hundreds of millions in building their organization to serve the market and fund R&D significantly to develop a robust pipeline of products. Since they will need additional financing they are not in complete control of their destiny. Current investors should expect the company to do a large secondary stock offering if they obtain FDA approval. Diagnostics is a very large long-term market opportunity that is ripe for innovation and investment. AXDX is a differentiated and controversial play that will become more institutionally covered and owned if they achieve the clinical results needed for FDA approval. Meanwhile investors can participate in the ebbs and flows of a stock with a rich valuation, no commercial product, and a bevy of short-sellers working hard to point out their failings. Our own work suggests that there is certainly some viable technology being commercialized at AXDX and management has a good handle on what they need to do and what others are up to in the marketplace. Perhaps they are overly confident (some say promotional) but we viewed them more as determined and willing to argue the merits of their approach. Time will tell (fairly soon) on this one. We suggest investors view the recent AXDX presentation deck from the Canaccord Growth Conference. Analyst coverage is limited but BTIG is on the case and their research is available via their website after registration. See the BTIG website for more.